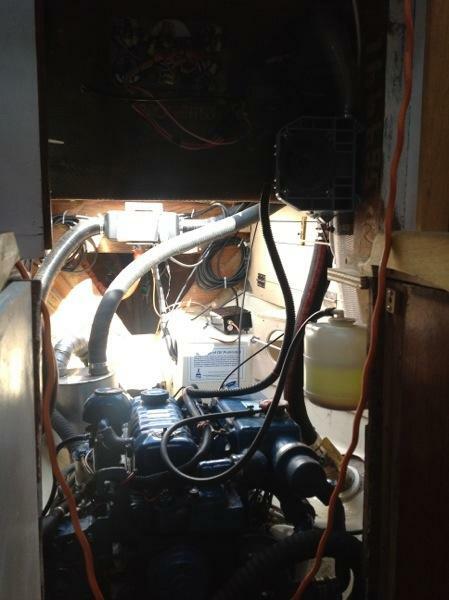 We have been quite busy here in Newport harbor working on some projects around the boat. 1. New engine room shelves! This has been on the list for a long time, and while we were back in New Hampshire for jury duty I used Darren’s table saw to cut panels to almost the right size. My first attempt at installation ended when the panels just didn’t fit, but a little bit of work with the jig saw and most of our messiest items like the grease gun and engine oil are now securely stowed inside the engine room. The top shelf has a plywood door on it that secures with a barrel bolt, while the lower shelf has a bungee and a large plywood lip to keep its contents in place. 2. A new downhaul for the genoa. Sometimes when the wind is really blowing the genoa doesn’t want to come down and Stephanie has to go out on the bowsprit to pull the sail down by the luff. 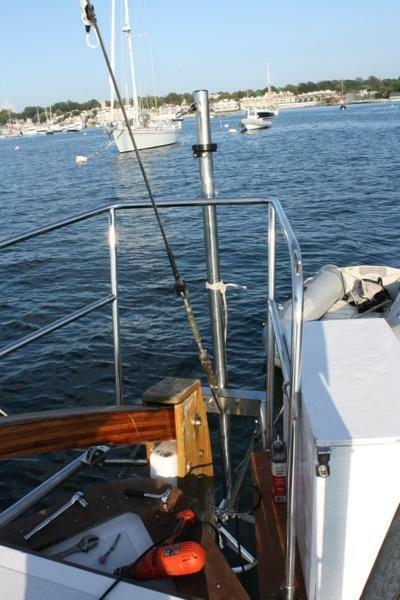 Since we are starting to head farther offshore we want to eliminate as many trips out the bowsprit as we can. 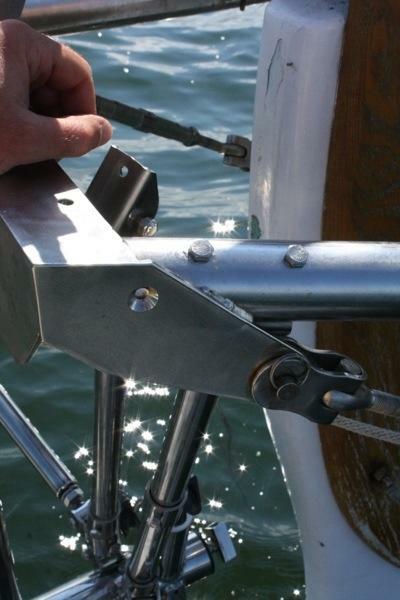 The new system is simply a block mounted at the base of the forestay and some fairleads back to the foredeck. 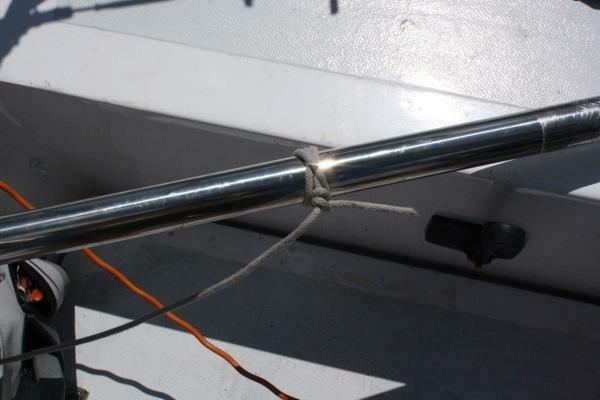 By running our old staysail halyard through this system the genoa can be pulled down from all the way back by the mast. 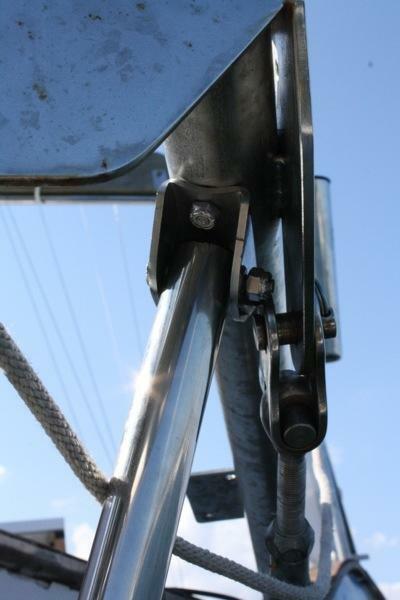 In addition the sail can be “locked down” by a cam cleat at the last fairlead. 3. New kayak tie downs. Using stainless lifting eyes from the Fastener Warehouse, our kayaks can now be ratchet strapped in place. The new lifting eyes are through bolted through the deck and sealed in place with polysulfide sealant. It was really hard to drill 3/8″ holes in our solid deck, but the kayaks are now fully secure. 4. Installation of our new Cape Horn windvane! This is one project that we are really excited about. This should allow us to set the windvane and then the person on watch will no longer have to steer the boat the entire time. We will be able to actually move about the boat while still maintaining a good course. The installation took a long time and involved a lot of steps, but it is now very solid and we should get a chance to try it out very soon. The first step was to fill up the entire inside of the boat with the box that the windvane was delivered in and read the instructions. An entire booklet of instructions but only about 1 page was for our model. The instructions basically read “bolt it to your boomkin”. Doesn’t sound too complicated, but… it does come out of the box looking like this. So now the parts are scattered across our bed, and the boxes with packaging are taking up the entire salon. The first step for me was to assemble the windvane “tower” so I could see what was actually going to be “bolted to the boomkin”. This part which was not in the instructions at all took well over an hour. After attaching the “quadrant” to the tower, it was time to start bolting pieces to the boomkin. 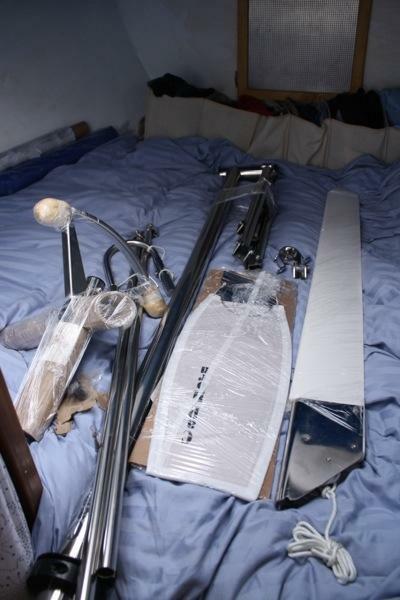 When we bought the boomkin, we were told that it was predrilled to accept a Cape Horn windvane. When it actually came time to start the bolting, none of the holes lined up at all. Very clearly they were not predrilled for this type of windvane. 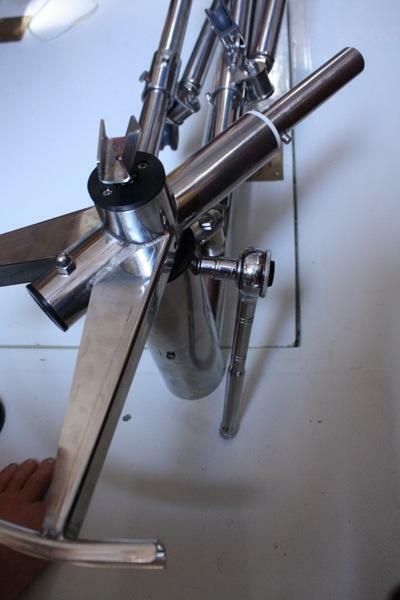 I very quickly learned that the hand powered drill that has seen a lot of use around the boat for drilling wood and fiberglass was not going to drill stainless, no matter how patient I felt like being. Fortunately this was a problem that could be solved by throwing money at it and a phone call to West Marine quickly located a power inverter that could power my corded hand drill for less than the cost of pulling up to a dock for the night and using their power. Of course getting to West Marine also involved an adventure of learning how to use the Rhode Island Public Transportation system and paying for a ticket from Newport to Providence ($2) and then getting off at the the first stop. Back at the boat it was time to start drilling holes. 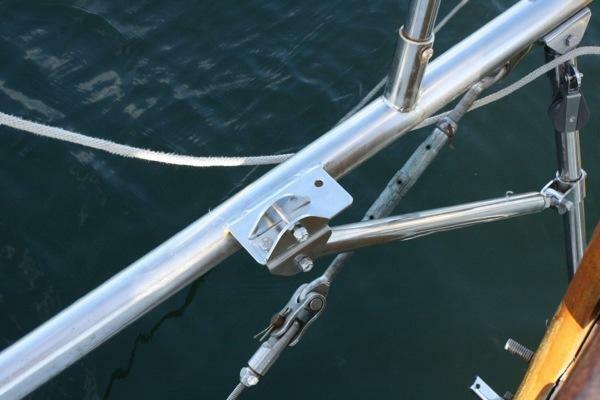 The first piece to be attached was the U-clamp that holds the windvane tower to the back of the bowsprit. Two holes and one broken drill bit later (drilling from a floating dingy isn’t the most stable platform) it was off to the hardware store for a new 1/4″ bit. Now it was time to move the windvane into place, we tied a safety line to the tower and Stephanie lowered it over the side of the boat while I guided it into place from the dingy. Next it was time to line up the arms that would bolt to the boomkin frame. After a lot of jiggling and adjusting and making sure the windvane was straight up and down the spots were marked and it was back to drilling. 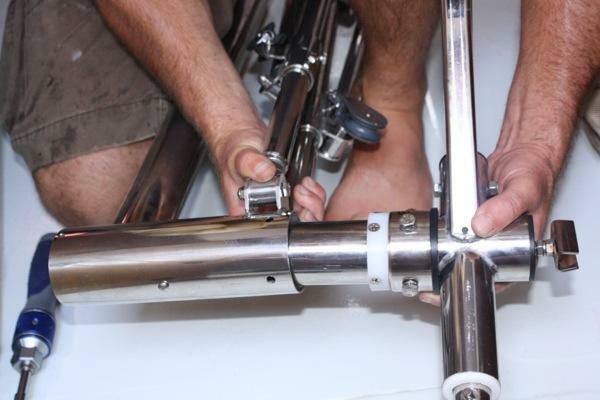 Then bolting the aft arms in place. Then it was time to attach the more forward set of support arms. 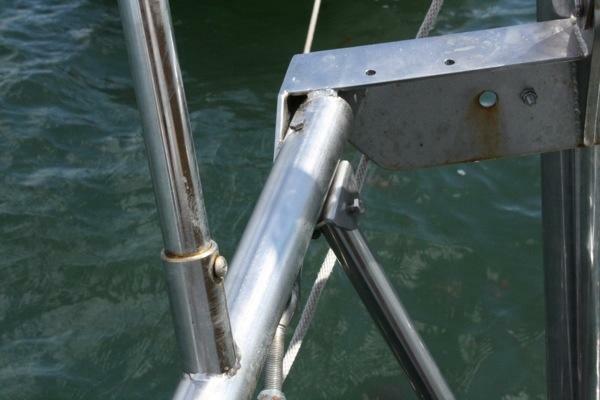 I think that they were originally meant to bolt on to the main tubes of the boomkin, but I decided to bolt them through the tabs that were originally meant for bolting on teak boards to cover the stainless bowsprit. This seemed to work very very well, and it was much easier drilling through the tab then on the rounded surface of the stainless tubes. The windvane came with 6 support arms, and suggested that if the u-clamp was used on the boomkin that only 4 were necessary. During the installation I added the attachment points for the extra 2 arms directly opposite the lower arms on the boomkin tabs. The tower is now bolted to the boat and all we need to do is attach the pieces that are kept inside when not in use and try it out! It looks like we’ll get an opportunity soon, hopefully it will live up to expectations. 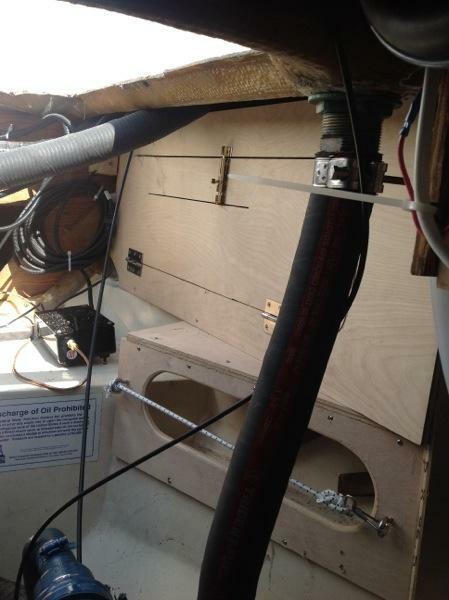 This entry was posted in Projects and tagged CapeHorn, installations, maintainence, Newport, shelves, upgrades by Brian. Bookmark the permalink.